I’ve been a bit tired and run down this week, along with not sleeping well, probably because of a virus. There seems to be something going around. My hairdresser was sick on Tuesday and had to reschedule my appointment. I changed it to this morning, and then she forgot about it and was a few minutes late getting to the salon. I told her no worries, I was half asleep myself! This evening the sun came out for just a little while after two very dark and rainy days. I feel perkier, and I’m looking forward to more fun on the weekend. Even when a few blah days happen, that’s just the way of things. 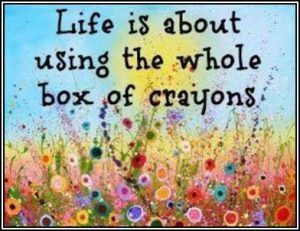 We couldn’t do as much with a coloring book, after all, if the box didn’t have the gray and black crayons to fill in the shadows. 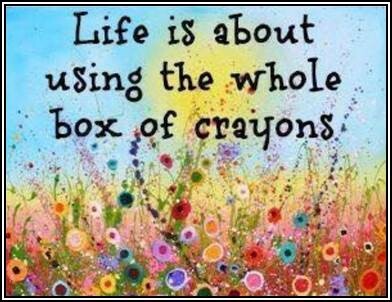 Love this quote and hope you can fight the virus going around and have more sunnier days!! Thanks, I slept better last night, so hopefully I’m getting over it. Perfect quote to go with your NT post. Thank you for sharing both — your experience in the week and the quote to highlight it. Thank you for contributing to Nurturing Thursday while I was away.